For admission to the top schools, high school grades in non core topics – PE, Music, Theater, Sports, Vocational Education, Health, Student Aide – do not count as much as grades in what are called college preparatory courses (four years of English, Science, Math and Social Studies; and 3-4 years of a language other than English). 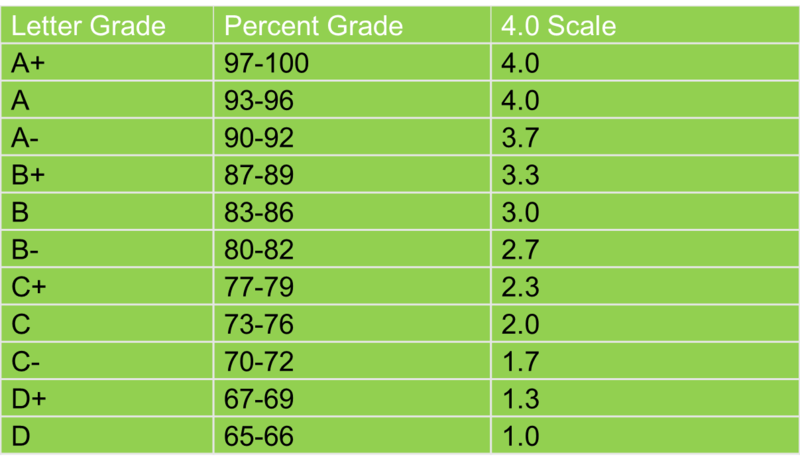 US grades are generally given out on a 4.0 scale. The College Board uses the above chart to convert raw scores to letter grades. The problem with this scale is that the grades are not weighted for difficulty. Most school districts offer three levels of classes for each grade. For example, a student in the 11th grade could enroll in on-level Chemistry, or take above-level Pre-AP Chemistry (also called Honors), or take college-level AP Chemistry. Awarding the same letter grade to students in all three classes for the same percentage grade is inherently unfair. 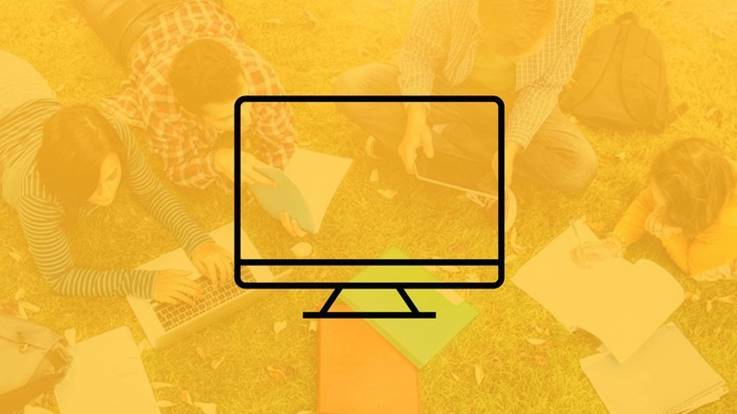 This would prompt students to take the easiest classes to get the best grades. 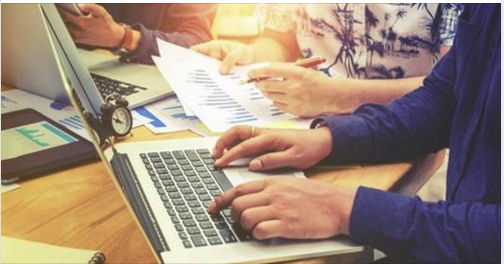 Colleges want to see that students take on the challenge of "above-level" classes and top universities want to see that students take the toughest courses offered by their high school. To incentivize students to do this, school districts offer a grade point bonus for taking difficult courses. In the above-weighted system, a student can earn grades on a 6.0 weighted scale for doing exceptionally well in a difficult subject. Called Tier III courses, these are taught at the AP/IB level in school and culminate in a national or international exam. An 11th grader taking AP US History and scoring a 98+ consistently during the school year would earn 6.0 whereas a student taking an on-level History class and scoring a 98+ would only earn 4.0. Tier II courses are not as rigorous as the Tier III and include Pre- AP, Pre-IB, Dual Credit, and certain approved Career and Technical Education (CTE) courses - in the above table, these are awarded on a 5.0 scale. Tier I courses are traditional on-level courses and no weighted GPA options exist. Unfortunately, school districts are not uniform in the way they assign the GPA bonus. In North Texas, different school districts have different GPA scales making it difficult to compare the performance of students across school districts. Even the designation of tiers is not uniform. Coppell ISD has four tiers (called levels), ranging from Level 1 to Level 4 (AP courses). As long as America has a decentralized, local K-12 system, these problems cannot be overcome. From a practical point of view, however, this is not really a problem. No matter what the grade bonus policy is in a school district, it impacts students only in that district, and within it, the particular high school. Weighted average GPAs are largely used in the computation of the class rank, so it really doesn't matter what the grade bonus policy is. Even rank computation is not uniform across school districts. HEB ISD uses all high school courses to calculate the class rank but Coppell ISD only uses a learner’s core classes (the so-called College Prep courses) to compute class rank. So, at Coppell ISD, if you took a dual-credit Career and Technical Education elective course in Robotics on the Honors scale, the grade would appear on your transcript, but would not be used to calculate class rank. All of this brings us to a basic truth about K-12 education. The class rank is only relevant to a high school graduating class - it's not even relevant across two high schools within the same school district. Two students with identical Weighted Average GPAs in Plano ISD would be ranked differently in Plano West HS and Plano Senior HS. 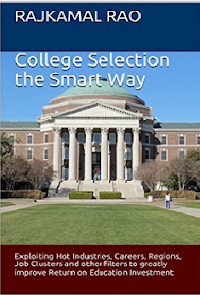 For college admissions and merit scholarship applications, at least as an initial screen, the non-weighted GPA therefore becomes somewhat important. This is the opposite of the weighted GPA, where the degree of difficulty of a course - the strength of curriculum - is of no numerical consequence. 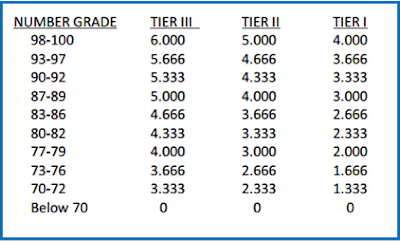 This would be the Tier-I table above. If you scored a 98, you would record a 4.0. When the College Board asks you on its college search page what your GPA is, you would type in the non-weighted GPA, not the weighted. How do colleges take into account the strength of curriculum then? They do this by digging into your transcript, course by course, and verifying how many difficult courses you took. Schools report the weighted average GPAs to colleges (via Naviance or Parchment) anyway, so colleges know which courses got a grade bonus. The actual bonus value is less important, but the fact that the student took a course which earned a bonus clearly factors into college admissions decisions in a rather significant way. Because getting good grades in tough high school courses is so important, high school students should plan on taking weighted credits to bump their averages up - and thereby improve their class rank. This is what successful students do when applying to top colleges and universities. The cumulative weighted average GPA is simply the sum of all the weighted average grades for each course in a student's high school career divided by the number of courses needed to graduate. 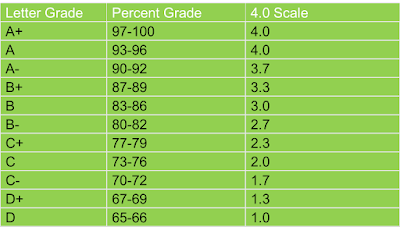 The table below shows a student's weighted average GPA, the non-weighted GPA and the College Board GPA (which has a more generous percent grade to 4.0 GPA conversion). If you want to track your student's GPA throughout his/her high school career, please take advantage of our High School GPA tracking tool. We will customize the tool to your teenager and it costs just $49.